I bought a few cans of coconut milk the other day and found, as often happens, the coconut milk had separated into cream at the top of the can with the water condensing in the bottom. This separation of the solids and liquids, I realized, is the perfect way to add a creamy element to a lot of different foods. My first thought was using these coconut milk solids (the coconut cream) to make icing, since they had a texture similar to chilled butter, albeit a bit creamier and less dense. However, I didn’t feel like messing with paleo flours to bake a cake or brownies, but I still wanted to mess around with the cream a bit. Then it hit me. If I mixed the coconut cream with a nut butter and some melted chocolate, it would develop a fudge-like consistency. Or that was my hope. So I gave it a try, and it worked. The result was a creamy, low-carb, vegan, paleo, tasty fudge with the perfect texture and the exact right level of sweetness. You’ll need to use canned coconut milk here – the full-fat kind, not lite coconut milk. Usually you can tell if the solids and liquids have separated by giving the can a shake and listening. There won’t be a liquid sloshing sound. If, for some reason, it hasn’t separated, then you can refrigerate the unopened can overnight, which should do the trick. The cans of coconut milk where this is most likely to happen are those without any additives or emulsifiers – so check the ingredients and make sure it only lists coconut cream and water. This is the type that is most likely to separate. When you open the can, pour away the water and use a rubber spatula to scrape all of the solid coconut cream out. Some stores also sell coconut cream, and you can use that, as well. Choose a nut butter that works with your diet. If you’re paleo, sugar-free, organic almond butter works well here. If you’re not paleo, then use organic, sugar-free peanut butter instead. I don’t specify an amount of liquid stevia (for paleo), or liquid sucralose (for non-paleo, low-carb) because sweetness preferences vary. I tend to like my dessert not very sweet, so I don’t add a lot of sweetener. To get the right amount of sweetness, add a bit of the liquid sweetener (5-10 drops), taste, add more, taste – and continue until you reach the desired sweetness level. Line an eight-inch square pan with parchment. In your microwave or on the stove, melt the nut butter and chocolate. If melting on the stovetop, do it on low heat and stir frequently. In the microwave, cook on high for 30 seconds, stir, and repeat until smooth. In a medium-sized bowl or stand mixer, beat the melted chocolate and nut butter, coconut cream, vanilla, and sweetener until smooth. Taste and add more sweetener as desired. Pour into the prepared pan using a rubber spatula to spread it in an even layer. Freeze for one hour. Cut into squares, and store the fudge in a zipper bag in the fridge or freezer. I have always been a baker. Puttering around in the kitchen baking stuff is one of my favorite ways to while away an autumn weekend afternoon while Jim watches football. With the celiac disease and my low-carb, paleo diet, however, I stopped engaging in that love. It’s only been recently that I’ve started tinkering with baking once again. This recipe came to me in a flash of inspiration a few days ago, and I decided last night to give it a try. I was worried about lots of things – tweaking ratios, etc., but the cookies came out really well on the first try. Feel free to mess around with the flavor profiles. I love the way the orange, spice, almond, and chocolate blend in this tasty recipe. The cookies are paleo-ish – the erythritol in the sweetener renders them not quite paleo; however, if you aren’t baking low-carb, you can replace the sweetener with coconut sugar. It will raise the carb count, but keep the cookies paleo. So it’s a matter of blood sugar vs. staying totally paleo. Preheat the oven to 350 degrees Fahrenheit. Line a 9×13 inch baking pan with parchment. In a large bowl, mix one cup of the coconut oil with the Swerve or Truvia, almond extract, orange zest, and Chinese Five Spice powder until well blended. Stir in the eggs, beating until well-combined. Stir in the almond flour and the sea salt, mixing until well combined. Spread the dough evenly in the prepared baking pan. Bake in the preheated oven until the cookies brown slightly around the edges (the top won’t brown), and the dough doesn’t have much give on the top, about 30 minutes. Cool for ten minutes. Lift the cookies out of the pan by lifting the parchment. Allow the cookies to cool completely on a wire rack. In a small saucepan, combine the remaining two tablespoons of coconut oil and the chocolate. Cook, stirring constantly, on low heat until the chocolate melts. Stir in the stevia a few drops at a time until you achieve the desired sweetness. The cookies are quite sweet, so I made my chocolate only lightly sweet to serve as a slightly bitter counterpoint to the sweetness of the cookies. Spread the chocolate in a very thin layer (or drizzle it artistically) on the cookies. Allow the chocolate to sit at room temperature for about 20 minutes to harden the chocolate slightly. Then, cut the cookies into small bars and transfer them to plates. Refrigerate to completely harden the chocolate. Since I don’t eat a lot of sweet stuff, I’m keeping these cookies in the freezer, at the ready for when I need a sweet treat, or when I just want a taste of something completely different. Yes – I know it’s after Thanksgiving, but some people turn around and make stuffing again at Christmas. Plus, I didn’t want to offer you a stuffing/dressing recipe until I’d tried it out on my own. That way, if it was terrible, we all would have all had disastrous stuffing on Thanksgiving. It wasn’t – it was tasty. In a large pot on medium-high heat, cook the pancetta and sausage,stirring occasionally, until browned, about five minutes. Remove the pork from the pot with a slotted spoon and set aside in a large bowl. In the pot with the fat from the pork, add the paleo-friendly fat and cook until it melts. Add the onions and carrots and cook, stirring occasionally, until soft, about five minutes. Remove from the vegetables from the fat with a slotted spoon and add to the bowl with the pork. In the same pot, add the celery and apples. Cook, stirring occasionally, until soft, about five minutes more. Add the garlic and cook, stirring constantly, until garlic is fragrant, about 30 seconds. Add the entire contents of the pot (including the fat) to the bowl with the other vegetables and the pork. Add the almond meal, rosemary, sage, thyme, salt, pepper, and eggs. Mix well. Spread the mixture in a large casserole. Bake in the preheated oven for one hour. Try replacing the apples with about a pound of chopped mushrooms. To quickly chop the herbs, put them all in a food processor and pulse for about 10 one-second pulses, or until well chopped. I used to bake all the time. Since we’ve been on the whole paleo/low-carb diet, however, baking has gone by the wayside. Not because there aren’t good paleo and low-carb baking recipes out there, but just because I don’t really see the need to have a lot of tempting desserts around the house. If they’re there, I’ll eat them. However, today is Jim’s birthday. 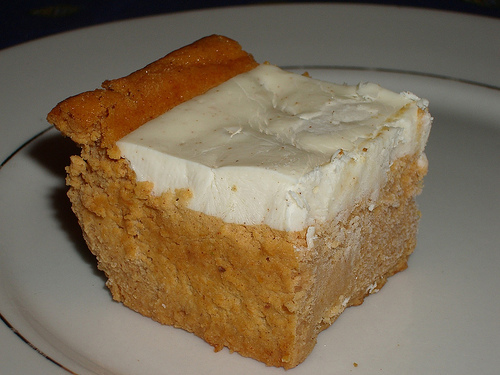 He used to love my Pumpkin and Caramel Whiskey Cheesecake with Chinese Five-Spice. He has been expressing sadness that he can never, ever have that again. So I decided to do a little adaptation. While I couldn’t find a way to make it paleo, I did find a way to make it low-carb. So here is the recipe with a low-carb makeover. Butter a 9×13 inch baking pan. Pour filling over crust, using a rubber spatula to spread it evenly. Bake at 350 for 30 to 35 minutes, until the center sets. Cool on a wire rack for five minutes. Leave the oven on. Meanwhile, combine the topping ingredients, whisking to combine. Spread over the bars and return to oven. Bake an additional five minutes. Cool for two hours on a wire rack and then refrigerate for three hours. 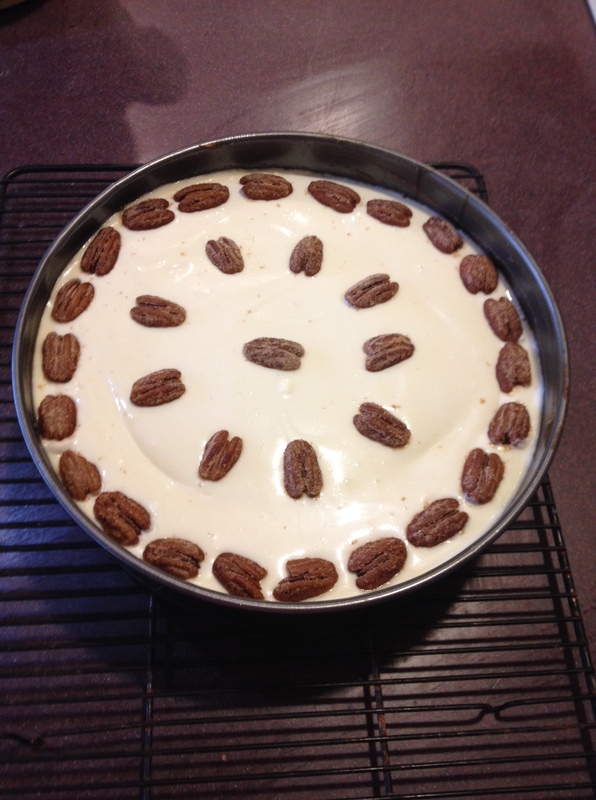 Top with spiced pecans (below). In a small bowl, combine sweetener, cinnamon, and five spice powder. Toss hot pecans in sweetener mixture. Use the pecans to garnish top of the bars. I’m excited to share this one with you. It makes a great special occasion meal. We had it for New Year’s Eve, but you can make it any time. I wanted to wait to post the recipe until I’d fully developed it – wouldn’t want to steer you wrong, but with this combination of flavors it was pretty hard to go wrong. This recipe is gluten-free, dairy-free, low-carb, and paleo. I made the duxelle a day ahead of time and refrigerated it so it was completely cool before I put it in the beef tenderloin. Put the tenderloin on on the counter for an hour before cooking it to bring it to room temperature. Save the marinade to combine with a few extra ingredients to make the sauce. Boil the marinade for five minutes to cook out any bacteria. To butterfly the tenderloin, slice it lengthwise about halfway through the meat, and then slice horizontally into each side of the cut. Fold the meat outward to make a flat fillet. I use a spiralizer for the shoestring potatoes. 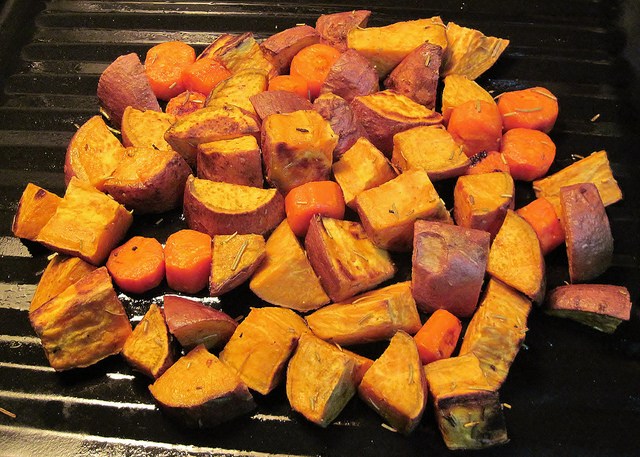 However, you can also use a mandolin on the thinnest setting, or even grate the sweet potatoes. For super low-carb, eliminate the sweet potatoes. If you’re not comfortable cooking with wine for paleo meals, then eliminate the sauce, skip the marinade, and replace the wine in the duxelle with homemade beef broth. While you can roast the beef in the oven, if you’ve got a smoker, I highly recommend using it. In a large saute pan, heat the duck fat until it melts and shimmers. Add the mushrooms and cook, stirring occasionally, until the juice from the mushrooms has evaporated, five to seven minutes. Add the shallots, salt, and pepper and cook, stirring occasionally, for another five minutes, until shallots are soft and mixture is dry. Add the wine and cook, stirring frequently, until the liquid evaporates. Refrigerate the duxelle and allow it to completely cool before using in the roast. In a small bowl, whisk together all ingredients until well combined. Place the butterflied roast in a flat dish and pour the marinade over the top, covering the beef. Cover with plastic wrap and refrigerate overnight, or up to 24 hours. Heat the oven to 375 (or, we used a smoker – heat that to 375). Remove the roast from the marinade and pat it dry. Reserve the marinade for the sauce. Lay out a large piece of plastic wrap, and lay the strips of bacon in it in a row, slightly overlapping. Place the roast on top of the bacon strips. Spread the roast with the chilled duxelle. 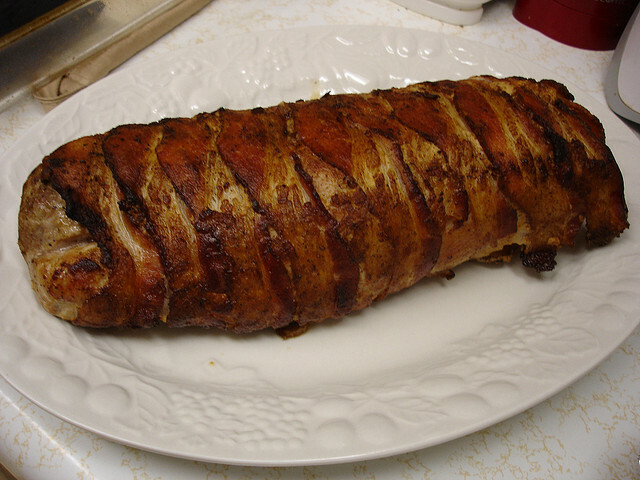 Use the plastic wrap to roll the bacon completely around the roast. Tie the roast with butcher’s twine to keep the bacon in place. Heat a large ovenproof sauté pan over medium-high heat. Add the roast and cook, searing the bacon on each side until it begins to brown, three to five minutes per side. Move the sauté pan to the preheated oven and cook until a thermometer reads 130 to 135 degrees Fahrenheit, about 30 minutes. Remove the roast from the oven and allow it to rest for 20 minutes before carving. In a large saucepan, heat the reserved marinade over medium-high heat until it boils. Boil, stirring occasionally, for five minutes. Reduce the heat to medium and whisk in the remaining ingredients (except salt and pepper). Simmer until the liquid thickens and reduces, about 20 minutes. Preheat the oven to 400 degrees Fahrenheit. Line a baking sheet with parchment. In a small bowl, toss together the sweet potato strips, melted duck fat, and sea salt. Pour the potatoes onto the parchment-lined pan in a single layer. Bake until the potatoes are crispy, 20 to 25 minutes. To serve: After resting the roast for 20 minutes, slice it and carefully remove the twine. Spoon the sauce over each piece of beef and top with the crispy sweet potatoes. For sides, we served garlic sautéed green beans and a green salad.